The local bourse was in hot water on Thursday due to continued US-China trade war strain placed on global markets. At the close of business, both the All Share and the Top 40 had fallen over 1%. US markets saw a dark Thursday as lower oil prices, US yield concerns and increased fears around the Sino-US trade war plagued indexes. At 20h40, the Dow and the S&P 500 had both fallen by more than 2%. European shares tanked on Thursday after Huawei CFO was arrested in Canada, which led to auto and tech shares declining severely. The STOXX 600, the DAX, the CAC 40 and the FTSE 100 all ended the day by more than 3% down. Asian markets were pulled down on Thursday by sharp losses in technology shares after the arrest of Huawei’s global CFO in Vancouver, which could increase trade tensions between the US and China. At 20h20, the Hang Seng had fallen by 2.55% and the Shanghai by 1.68%. Thursday was a troublesome day for Japanese markets as chip-related shares tumbled severely in light of the tech giant Huawei’s CFO being arrested in Canada on request of the US. At 20h25, the Nikkei traded 1.91% lower. Most emerging-market currencies were under pressure on Thursday due to global risk aversion. Moreover, the rand slipped almost 2% against the dollar as SA’s current-account data depreciated. At 19h45, the rand traded R14.10 to the dollar. Although gold prices stumbled slightly on Thursday as the dollar strengthened, the global decline in equities helped keep it close to its five-week high. At 20h30, spot gold traded at $1 239.48 an ounce. Oil prices dropped almost 4% on Thursday as no output decision was announced after the OPEC meeting. At 20h35, Brent crude cost $59.48 per barrel. Its been a long week. And a long week of loadshedding by ESKOM. This will ofcourse have serious knock on effects on South Africa's economy that just emerged from a technical recession. 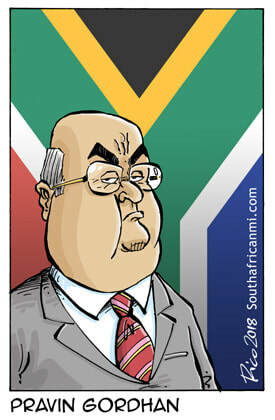 See more about this on our SA GDP page. So ESKOM claims there is not enough coal, or they dont have enough coal reserves. Well as we showed yesterday South Africa exported 56 million tonnes of coal in 2018 alone. And of that about 27 million tonnes went to BRICS counterpart India. So there is obviously enough coal available in South Africa. And surely ESKOM can buy the coal that is destined for the export market if they pay the right price for it. Stop looking for excuses ESKOM and fix your sh!t. Minister of Public Enterprises, Pravin Gordhan announced yesterday that the leave of ESKOM's senior management has been cancelled so that they can address the current challenges faced by the company.